The Biggest Name In Records Protection Just Got Bigger. Literally. Introducing the FireKing Fireproof Record Storage Cabinet – big protection for oversized documents, binders, end-tab filing, Bankers Box, and other valuable items. Complete with adjustable shelves, this cabinet is also equipped with a high-security Medeco key lock and scratch-resistant finish – providing a lifetime quality appearance. 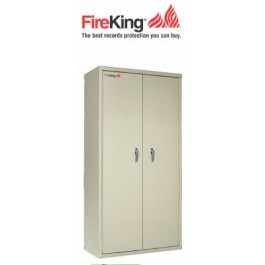 The FireKing Storage Cabinet is available in either a 72" or 44" high model. Both come with a UL 1 hour fireproof rating classification. The most trusted name in fire-resistant storage proudly offers the FireKing® Storage Cabinet, now with convenient accessories. As always, your oversized documents, binders, end-tab files, Banker’s Box® and other valuables are safely housed within our UL® Class 350° 1-Hour Fire Rated cabinet. But now, with FireKing’s additional convenient storage accessories, you can organize and personalize your method of accessing your files any way you see fit.